June 29 is National Almond Buttercrunch Day. This candy is great to sedate everyone with sweet tooth, but it brings the crunch, and you know it. Almond buttercrunch is American invention that became popular during World War II. At that time almond buttercrunch was shipped to American soldiers, who fought overseas, and the confection became an international hit. 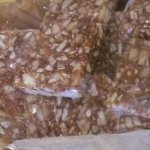 The recipe of almond buttercrunch was developed by the candy company Brown & Haley. The candy was named Almond Roca because most almonds used for production came from Spain. And as far as the candy was as hard as a stone, Spanish word “roca” (stone in English) was chosen to describe the crunchy texture of this sweet treat. Unfortunately buttercrunch isn't tasty if it's not fresh. Brown & Haley's co-founder J.C. Haley found a great way of storing the candies. He figured out, that if tins kept his favorite coffee fresh, they would do the same for the candies. Remember, if you want to store buttercrunch fresh, use tin or an airtight container.